KHA Student Fellow Experience in Washington, D.C.
What’s New at Ka Huli Ao? In 2004, I met Jerry Dupont,** founding Director of the Law Library and former Acting Dean and Professor at the William S. Richardson School of Law, when I interviewed him for an oral history project during law school. At the time, Jerry was the Executive Director of the Law Library Microform Consortium (LLMC) which was based in Kāne‘ohe at the Windward Community College. It was a memorable interview for me because Jerry’s vision behind LLMC revealed the sheer dedication and commitment that it takes for those who seek to preserve history for future generations. I had no idea that I would one day have the privilege of being a part of this vision of preserving and sharing Hawaiʻi’s legal history. LLMC was established in the 1980s to convert public domain legal and law-related materials from print to microfiche format. Over time, for reasons of preservation, collection enhancement, and space savings, LLMC shifted its focus to expanding its online database: LLMC-Digital. To accomplish this endeavor, LLMC digitally scanned print materials and converted microfiche copies in situations where no viable print source remained. As part of this process, Jerry realized that many of the rare, difficult to access legal and law-related materials were stored at the Hawaiʻi State Archives. Jerry had a terrific working relationship with the State Archivist, Susan Shaner. It was through this relationship, Jerry suggested the use of LLMC equipment to scan archival materials housed at the Hawaiʻi State Archives. From there, in 2005, state archives staff Luella Kurkjian took up the mantle, and led the digitization effort by evaluating the suitability of and designating materials appropriate for scanning. 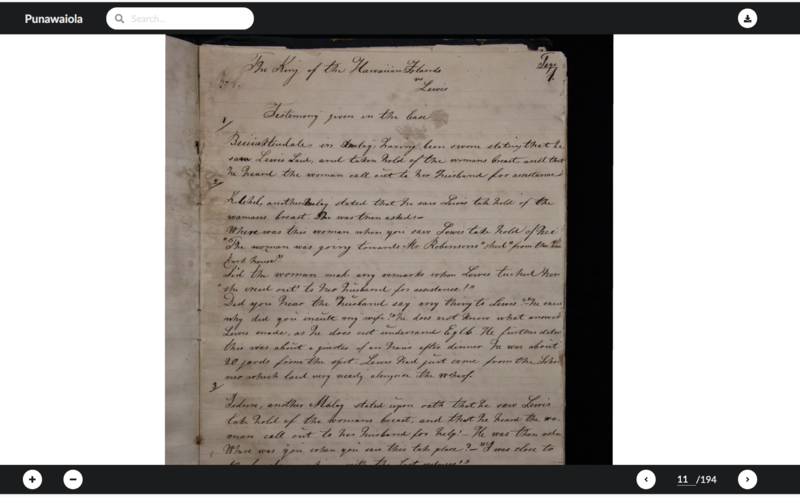 Inspired by this work, the William S. Richardson School of Law and Ka Huli Ao became actively involved and participated by lending equipment and staff to help expedite the digitization process. Lei Seeger, former Director of the William S. Richardson School of Law Library, helped guide the process on behalf of Ka Huli Ao. 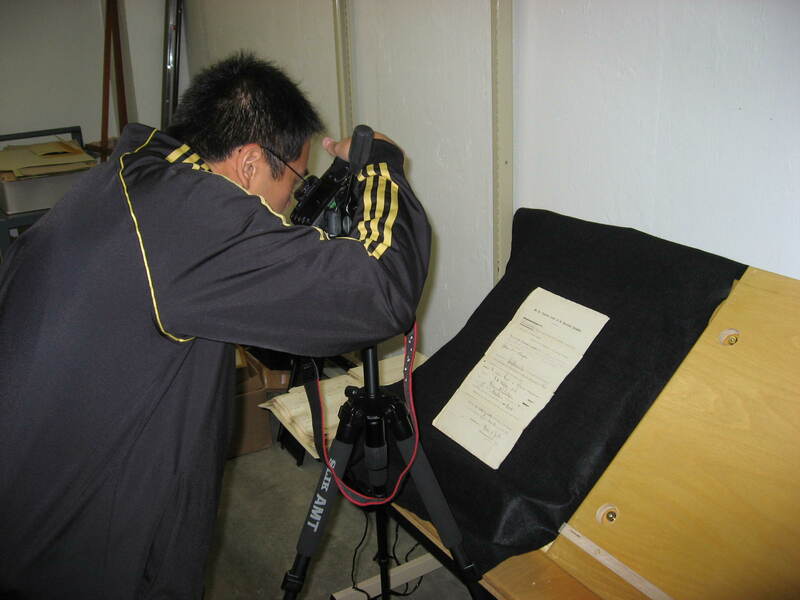 By 2008, Ka Huli Ao staff were fully immersed at the State Archives working with LLMC’s high-speed scanner, and a custom book cradle that was powered by a Canon Mark II 5D (as shown in this picture here below). All digitization work followed LLMC protocols, which at the time, involved digitizing and converting images into TIFF form (tagged image file format). These materials were then forwarded to the University of Michigan, where the images were “OCR’d” (optical character recognition: electronically converting printed material so that the text can be imported, searched, and edited). Metadata and cataloging information were provided by the St. Louis University Law Library staff. For those who have not had an opportunity to see the infrastructure, architecture, and plans for the State Archives digital archives program are highly encouraged to do so. In short, because of our long-term partnership with the State Archives, Ka Huli Ao can rest assured that cataloging, metadata, and long term preservation of digitized materials dating from 2005 will be safely and professionally handled. 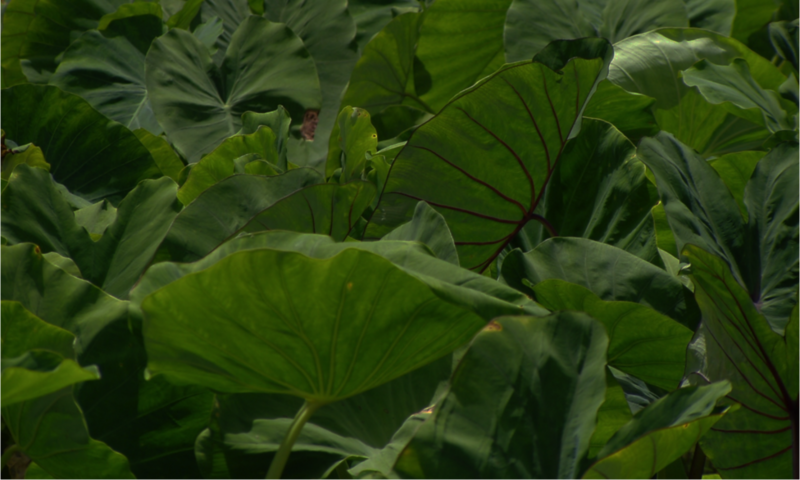 The above moʻolelo stands as a testament to the benefits of working collaboratively together and I am reminded of the ʻŌlelo Noʻeau: “ʻAʻohe hana nui ke alu ʻia; No task is too big when done by all.” Much gratitude is owed to all who contributed to making this dream a reality: Jerry Dupont of LLMC, Susan Shaner, Luella Kurkjian, and Adam Jansen from the Hawaiʻi State Archives, and Kale Hannahs from the Office of Hawaiian Affairs. Mahalo nui! It is hard to believe that Punawaiola was created 10 years ago. At the time, Ka Huli Ao sought to create a website that would allow users to search and have access to rare, fragile, and historically significant legal materials from the Kingdom era. Keith Johnston and Ray Wang brought this vision to life, and created Punawaiola (for tech-junkies, they used the following system architecture: Fedora repository, Apache Tomcat, SQL server, and Solr). Keith’s talent as a web and database developer allowed Punawaiola to flourish. At the time of Keith’s departure from Ka Huli Ao in 2013, Punawaiola had a total of 5 collections with 33,000 images available online. Today, we are proud to announce the official start of beta-testing for the newly redesigned Punawaiola website. This version of Punawaiola was designed and created by myself and Ray Wang—largely because it was cost-prohibitive to hire a developer to do the work. The first round of testing began in December 2017, and we are indebted to those volunteers who helped us identify and test various functions of Punawaiola. As of April 2018, we now have a total of 35 collections with 184,000 images available online. Quite a feat considering we lack web development experience. Nonetheless, it was our opinion that it was necessary to get these materials out to the public. Ka Huli Ao had amassed a huge collection and it was time to share it with the world! In terms of our digital holdings, in addition to primary legal materials (constitutions, statutes, session laws, reported cases), we also have the Attorney General records (1844-1893), Foreign Office & Executive Chronological Files (1790-1849), and the Privy Council records. One significant collection that is nearly completely digitized is the Foreign Office and Executive Treaties collection, which includes treaties with countries such as: Austria, Belgium, Bremen, China, Sweden and Norway, Netherlands, Prussia, and Switzerland. Punawaiola is now a responsive site, which means that it renders on a variety of devices and window or screen sizes (such as mobile phones or tablets). Importantly, all PDFs are fully searchable if it contains text (as opposed to manuscript), and search suggestions are provided for users in the search field. One major hurdle that we needed to address was the enormous file sizes of many of the PDFs which resulted in lengthy download times for our users. To resolve this issue, UH Mānoa student and talented web-developer Il Ung Jeong**** created a custom PDF viewer that would allow partial and non-blocking rendering of the documents. The custom PDF viewer will asynchronously fetch the data needed to display the first few pages of the document without waiting the entire duration of the download. From the user’s perspective, a download that could average anywhere from 20 – 60 seconds will seemingly be instantaneous. Additionally, the custom viewer includes the following features: search functionality, magnification options, download and printing capabilities, and page toggling. We are presently working on a number of other features that we feel will enhance the website for our users. For example, it is our hope to make Punawaiola bilingual. The new site is located at www.punawaiola.org. However, we are limiting access during our beta-testing period so we can work directly with our testers to improve features on our site. We anticipate launching the site in the very near future! * Mary K. Pukui, ʻŌlelo Noʻeau: Hawaiian Proverbs and Poetical Sayings 18, #142 (1983). ** Many thanks to Jerry Dupont for taking the time to meet with me this past month and to share his memories about this digitization project. *** Mahalo nui to Adam Jansen for his continued support and for reviewing this article to ensure that his thoughts are accurately expressed here. **** Ray and I would like to personally thank Il Ung Jeong for his savvy advice and tireless work ethic.